(Reuters) – Fired FBI director James Comey’s memoir that details his private meetings with U.S. President Donald Trump sold some 600,000 copies in all formats in its first week, its publisher said on Tuesday, the latest in a series of best-selling political books. Comey’s “A Higher Loyalty: Truth, Lies, and Leadership,” has so far outpaced Hillary Clinton’s campaign memoir “What Happened” and journalist Michael Wolff’s behind-the-scenes White House expose “Fire and Fury” in opening week sales, according to industry figures. 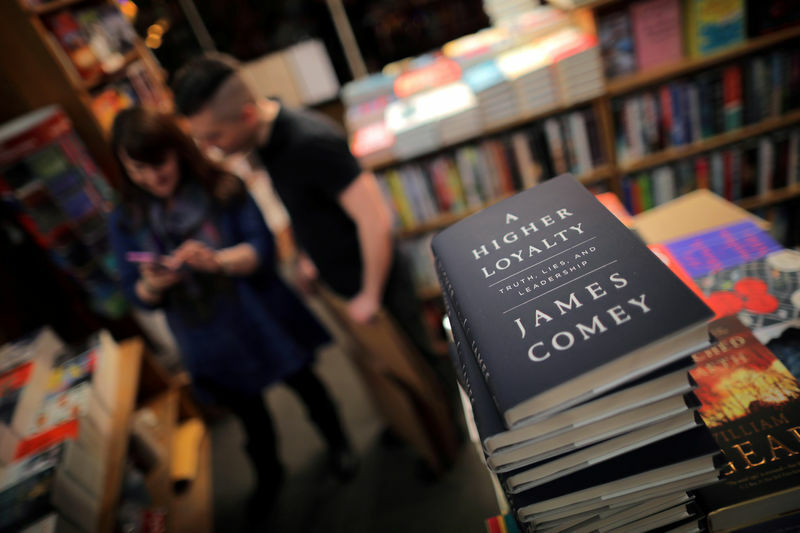 Publisher Flatiron Books, a division of privately-owned Macmillan, said it has printed more than 1 million copies of Comey’s book, which has made national headlines. Flatiron did not say whether the first week sales were global or limited to the United States. The book has drawn Trump’s ire as Comey compared the president to a mob boss who stresses personal loyalty over the law and has little regard for morality or truth. Trump dismissed Comey in May last year while the FBI was investigating allegations Russia meddled in the 2016 presidential election and possible collusion between Russians and Trump’s campaign. “A Higher Loyalty,” which is billed as Comey’s thoughts on leadership, was atop Amazon.com’s (O:AMZN) bestseller list for several weeks before its release. Clinton’s “What Happened” sold more than 300,000 copies, including hardcover, e-book, CD and digital audio, in its first week after publication in September 2017, according to CBS Corp-owned (N:CBS) publisher Simon & Schuster. Wolff’s book has sold nearly 975,000 print copies, and Clinton’s memoir has sold some 511,000 total print copies, according to NPD BookScan.